Dogs worked year round anyway, summer and winter. Summertime, they used dog packs [to carry loads] and then in wintertime, they used the dog harness, this kind of harness. 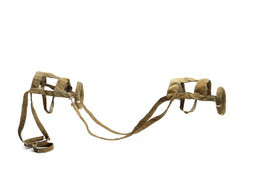 This is an old style Koyukon straight-line harness for hitching one dog directly behind another, a better arrangement for narrow forest trails than the side-by-side pairings used by contemporary dog mushers. The harness is made of moose hide and canvas, with padded “work collars” that were comfortable for the dogs when pulling heavy loads. It has places to attach decorative “dog antlers” that were draped with ribbons and yarn for holidays. Dogs pulled toboggans, sleds, and even canoes. Eliza Jones: Łeendenaaloy [dog harness]. . . .
Trimble Gilbert: Łąįį tł‘yàa, dinjik dhah łąįį tł‘yàa. Eliza Jones: So, you would say it the same way? Phillip Arrow: It’s almost same thing. Łe dinaloy [dog harness]. Judy Woods: Almost like ours. Eliza Jones: Okay. Can we let Trimble talk about it first? Trimble Gilbert: I seen this kind of harness, 1951, I think, in Ft. Yukon. During that time, no snow machines, people still using the dogs. And one old man, his name is Jacob Luke, he had this kind. I don’t know how many of them he got, maybe four, four or five and they use this kind. It’s just like a snap [toggle at end], but they put it under dogs and they put it on other side here. See that [loop on other side] right here? They put it under the belly, and then they put it like this [toggle through loop]. It won’t come out. Eliza Jones: So this [second set of straps] one? Trimble Gilbert: Another one [dog] right here. . . . This way [directly behind first dog], a straight harness, so it’s easy. Eliza Jones: Oh, so this is called straight harness? Trimble Gilbert: Yes, straight harness. And right here [circular yoke], they usually put łąįį jì‘ [dog antler], that yarn. Eliza Jones: That was for the tassel. Kate Duncan: . . . It the yarn attached to the metal? Kate Duncan: I’ve heard it called a standing iron. Trimble Gilbert: Łąįį jì‘ reh [that is dog antler]. Dog antlers they call it. Eliza Jones: . . . So, that looks like caribou skin or moose hide? Trimble Gilbert: This is moose hide. . . . I seen this and look like they sew it with that babiche [strips of rawhide]. Trimble Gilbert: Because this is kind [for] heavy pulling.
. . . I think this is for a medium dog. Eliza Jones: . . . I remember growing up was even when my husband and I first had dogs, people make their own dog harnesses. And some dogs were big, some dogs were smaller, so that you make the harness according to the size of the dog. Eliza Jones: . . . When we had dogs, I did the sewing. I just made them on sewing machine. My husband just measure it out, just tell me where to sew it. I did the sewing on there. Thankfully, now you can go to the store and buy the harness [laughter]. Eliza Jones: A long time ago, they were big dogs. Trimble Gilbert: Yes, according to the pictures, we see dogs everywhere, they’re big. I don’t know what happened, we lost that because house dog came in . . . and then breed is changed. So now it’s hard to get any big dogs. There aren’t very many of them left. . . . Packing dogs too. They work year round anyway, summer and winter. Summertime they use dog pack and then wintertime, they use dog harness, this kind of harness. And probably not too many dogs, five, six. Seven it’s too strong. You can handle maybe five or six. Eliza Jones: You know, you have to feed them. Food was hard to get, so you have to not have too many dogs. Eliza Jones: And they didn’t even really need that many dogs. Trimble Gilbert: No, five is really strong. You can handle it. But I remember when I was kid, and I use only two because they’re too strong. Aron Crowell: . . . Were there different ways to hitch up dogs? This one, you have two in a line. Were they ever hitched up with a line for each dog? Trimble Gilbert: Next to each other? Trimble Gilbert: No, just a straight harness, that’s all we use long time ago. The dogs all lined up – leader and next one and third one and fourth one. And later on, they come up with different kind, so they put two dogs. But this is just for the trail, snowshoe trail, one trail, not the wide one. Where people walk with snowshoes it’s about this [two feet] wide. So they use only one person to break trail. so one straight harness. Trimble Gilbert: Mm-hmm. I got my own team, I remember, and I walk ahead of them, so they just behind you, so they know. I didn’t have any problem, but only time is problem is going up the hill, and you have to break trail first, and then come back and you have to get behind them, to pull that toboggan, and then go up and start over again. When it’s level, you don’t have problem. NMAI staff: Why is that? Dogs didn’t want to go uphill? Eliza Jones: No, it’s hard pulling. Trimble Gilbert: With heavy load, you got to help them, push behind them. Dog sleds are an ancient and widespread means of transportation for Eskimo/Inuit peoples, but when non-Native fur traders and explorers first traveled the Yukon River and other interior regions in the mid-19th century they observed that only a few Athabascan groups, possibly including the Koyukon and Deg Hit’an, used dogs in this way. Both of these peoples had probably learned the technique from their Iñupiaq or Yup’ik Eskimo neighbors. The Gwich’in, Tanana, Ahtna and others pulled their sleds and toboggans by hand, using dogs solely for hunting and as pack animals. (1) However, Russian and Hudson’s Bay Company fur traders eventually popularized the dog sled until it was used nearly everywhere for winter travel. This is a straight-line harness for hitching one dog directly behind another. As Trimble Gilbert explained, this is a better arrangement for narrow forest trails than the side-by-side technique that was introduced by fur traders. (2) The harness is made of moose hide and canvas, with padded “work collars” that were comfortable for the dogs when pulling heavy loads. Dogs pulled toboggans, sleds and even canoes, at least among the Koyukon. (5) This method was used to go upriver against the current, with the dogs walking on the bank and attached to the boat by a line.